The second annual White House Summit on Next Generation High Schools took place on Monday, September 12, in Washington, D.C. About two hundred district and state education leaders from across the United States, along with leaders from other government agencies, foundations, and research entities participated in the one-day event. The Summit was designed to be a part of a national conversation on transforming high schools to better serve all students and to catalyze new thinking on the challenges and opportunities for … making progress, especially at the state and district level. New Hampshire was represented by seven educational leaders; I was honored to be invited and participate in the Summit. In addition to remarks and statements by leaders from the White House Domestic Policy Council, the Council of Chief State School Officers, the National Science Foundation and others, our U.S. Secretary of Education John King also spoke to the group. Dr. King advocated for a “leadership environment that supports innovation” while he celebrated progress made that has resulted in the highest high school graduation rate in our nation’s history. In late morning, I participated in a break-out meeting that focused on supporting social-emotional learning; that is, helping students develop competencies in self-awareness, self-management, responsible decision-making, social awareness, and relationship skills. In this conversation, we reviewed the research on the critical connection between students’ emotions and learning, as well as the challenges in helping our young people develop these vital social-emotional competencies. Also mentioned was the advantage that small high schools hold over large high schools in this important work to personalize learning for all students. Increased likelihood of dropping out and feelings of stress and disconnectedness were noted as challenges that large high schools must face, especially when their students have come from smaller schools. I concluded my day at the Summit with both an affirmation of our Pittsfield school redesign and a strong commitment to continue to develop our schools for greater personalization to better serve our students and our community. I wish that every Pittsfield resident – both young people and adults – could have joined me at the Summit to hear that the vision of our nation’s educational leaders for our high schools is being actualized in Pittsfield. I know that you would as proud of both our accomplishments and our aspirations as I am. 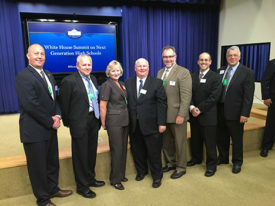 L to R: Jonathan Vander Els, Executive Director – New Hampshire Learning Initiative, Michael Hopkins, Superintendent of Schools – Rochester School District, Ellen Hume-Howard, Curriculum Director – Sanborn Regional School District, Paul Leather, Deputy Commissioner – New Hampshire Department of Education, Brian Blake, Superintendent of Schools, Sanborn Regional School District, Christopher Motika, Administrator, Bureau of Integrated Programs – New Hampshire Department of Education, John Freeman, Superintendent of Schools, Pittsfield School District.